Laurel here! It's so fun to be here. I feel like I should do some sort of introduction, but I fear that would bore you, so let's get onto the fun stuff! 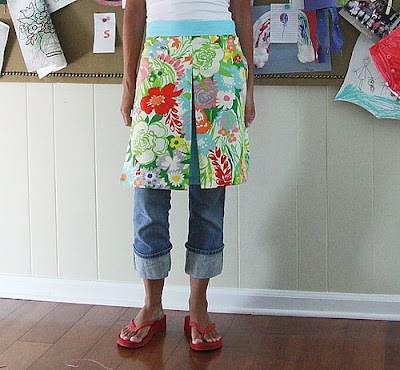 I know she was showing off her apron, but that bulletin board was awesome! I knew I could do this and she even gives some info on hers. First I went to Home Depot and asked for the Homasote - that's what Martha Stewart always uses. They looked at me like I was crazy, but google said Home Depot carries it, and I believed google. So, I went to another Home Depot. Finally I said something like "I think they use it to soundproof rooms or something." A guy led me straight to the board and we were both smiling. It is kind of big and kind of messy. The guys will cut it for you. My tip - get them to use their saws - not a utility knife! Lesson learned. I have some fake linen. I get it at Joanns by the muslin and it is about $3/yard - but at Joanns I always use a coupon. I started to cover the board, but since my sides weren't straight, I wanted to cushion them. Since I have three kids, I hate going out to do little errands like getting batting, so I made do with what I had. I had corduroy and cut 3"wide strips and just covered the edges. Then I stapled away! I bought nailhead trim, also at Joanns, and was kind of scared. I like straight lines and wasn't confident I could get it straight. I drew a light pencil mark 1" from the border. Then I started pushing then pins in. Because I was using whatever-the-name-Home-Depot-people-call-it, the nailheads pushed right in.Still, I think I sprouted some more gray hairs making sure they were straight! Then, I propped it against the wall and stared at it for a couple of days until I knew where to put it. Once I figured, I just screwed it into the studs. I figured the screws will always be covered with pictures, or drawings, or A+ papers. I cannot wait to fill this up. I just pinned in a couple of pictures I had around to see what it looked like. Darby has strings going across hers with little clothespins - love that! My friend suggested filling it up with black and white pictures - love that! Cost breakdown - $12 for the board, I had them cut mine into a 30"x60" and still have 2 other pretty big pieces. $3 for the fabric. $9 for the trim - but I only used half! I assure you, that although the pictures know make the trim look a little wonky - which is driving my OCD into overdrive right now and I've taken about 50 more pictures - they are laser straight! Maybe it's just the angles. or my less than great camera! Thanks Cheryl - if you miss her, you can find her here! Great job! I love Darby too and I love the way you saw something you liked and put it into action. This is a very timely post for! I am thinking of taking on a project similar to yours and I have been looking for nailhead trim everywhere. I thought I would find it in hardware stores but now I will look at JoAnn's. Thanks for sharing this! in love, i tell you! i have been wanting something like this inmy kitchen forever... now i know what to do. my empty little wall is just begging for photos and the kiddos artwork, but with class, ya know? That is so lovely! I'm totally in need of one in my kitchen! Wow...love that big bulletin board!! So perfect for families with kids and papers and crafts that for me, usually pile up in our kitchen! I think the nailhead trim looks great. I'm a little scared of it, but maybe I should try it. LOVE it!!!! I really like the black and white picture idea, like as a border all the way around the edge of it. Thank you for posting this! I have a linen board from Pottery Barn and I love it, but I really want another one. I didn't want o have to pay so much for it and this way I can customize it! I am excited to try it!